Alabama wide receiver Amari Cooper (9) eludes LSU cornerback Jalen Collins (32) on a 23-yard touchdown reception in their game in Baton Rouge, La., Saturday, Nov. 8, 2014. BATON ROUGE, La. 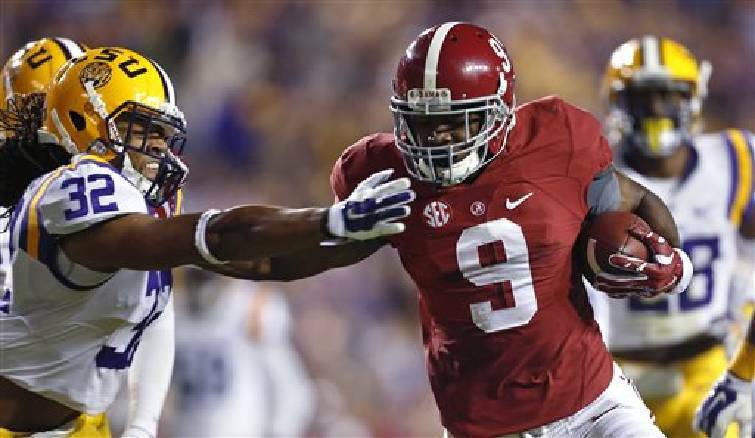 - Amari Cooper has broken Alabama's school record for career yards receiving with a 23-yard touchdown catch at LSU. Cooper's touchdown catch in the second quarter gave him 2,940 yards receiving, eclipsing the mark of 2,923 set by D.J. Hall in 2007. Cooper's total was on 180 receptions, 14 fewer than Hall. With a 9-yard catch late in the first quarter, Cooper also broke Julio Jones' 2010 single-season mark of 1,133 yards. In the fourth quarter, Cooper's eighth catch of the game broke Jones' Alabama single-season receptions record of 78, also set in 2010.010.